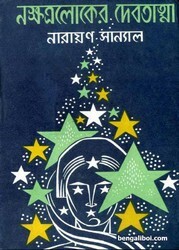 'Nakhatraloker Debatma' the ultimate science fiction book is written by the remarkable author Narayan Sanyal. I think, there is no mention of 'Tesseract' in any other science fiction Bangla book except this book. Although there are several books written in English with complex mathematical formula of 'Space-Time Continuum', this discussion is not seen in Bangla story. In this post, an interesting section of the book is given here. The ebook pdf has 58 pages, 14mb pdf file size.